I’ve been wearing my Moldavite pendant more often lately, even though I often hesitate to put it on all. I can’t always tolerate it’s energy. It can be jarring and disruptive. It can make me feel anxious and jittery sometimes. But here and there, especially when I feel my personal energy or that around me is undergoing a shift, I’ll wear it. It helps transitions go more quickly, realizations arrive faster, although not necessarily without pain. I mean, c’mon. Seeing today’s card (and feeling how I am feeling), transitions are on my mind. We’ve got the Six of Swords (Mercury in Aquarius). Thoughts (Mercury) in process of detaching (Aquarius). It’s a card of transition and then some! As you see the woman sailing ahead here, notice all the swords. It’s not an easy hop, skip, and jump from where she’s been to where she’s going. There’s a battle-weariness about this trek, a sense of being tired. The hardest part is usually done, but there are still some waves to go. So I don’t know. Maybe it’s work that has been pulling you under. Maybe it’s all the itchy-scratchy parts of having a kid grow up. Maybe it’s a relationship that’s been broken in ways you didn’t realize. Whatever the transition is about, it’s been hard. It IS hard. 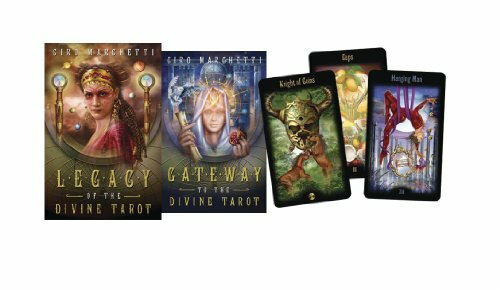 What comfort can Tarot offer? Well, the trip of the Six is well underway, and the most demanding part is likely over. As she’s sailing, i.e. the Water Element is in full force, a lot of the adjustment at this point is emotional. Not prominently pictured in this version but usually present is a rower in the back and sometimes, a child beside her. In other words, she doesn’t make the trip alone. I think this lady has the right idea—head held high, on the lookout, facing right, toward the future. I won’t say my own transitions have been easy or comfortable or pleasant by any stretch. They never are. Kind of the nature of the beast, you know? But I can say they’ve pretty much universally been necessary. I’m sure the ones I’m feeling today are NO different. So eh, you know? Just got to do it the best you can. Schedule a Tarot consultation with Dixie. I made up a new batch of my Psychic Oil under the recent Pisces moon. I use this oil before all my readings to help me connect. A bit of magic, you know? I like to mix up new batches under super watery moons, because, well, I want super watery energy. I generally get my carrier oil, set my intention, and then either add essential oils I’ve picked out beforehand, or (more often) fly by the seat of my pants. I’m of the opinion that my intuition will always serve more faithfully than my brain, so there you go. This time around, instead of just using all my own oils, I added a number of selections from Cedar’s magic oils. A shortcut. Meditation and Spirit Summons (in case I run into any dead people in my meditation!) and Moldavite and, well, I don’t even remember what all else. I was a regular mad scientist here! Now, when I mix this up, I usually draw a Tarot card to include from one of my Tiny Tarot decks–a small sacrifice, if you will, to the magical vibration. I always draw these blind, trusting Tarot to give me the right cards. This works very well. My last batch was graced by the intuitive Queen of Cups, for example. I couldn’t have been more pleased. I reached in my little bag, to grab a Tarot card for this mix. And a card popped out before I was ready. I had a jumper! “Oh, this will be good,” I thought. The card can’t wait to get busy. And the jumper was…the Three of Swords. You know where I’m going with this, right? If you work the cards, I’m sure you do. Yes, this batch of psychic oil is now graced by the Three of Swords. I’ll say no once, but not twice. And to be fair, this is a watery card via illustration, even though it’s associated with Saturn in Libra. And okay, the irony is appropriate–a confusing card for Pisces moon. Understood. Letting go, loss, separation. Release, release, release. Allow the void. Let go of preconceptions. To access the ethereal, one must separate from the physical. You cannot demand the answer be what you want–only open yourself to the answer that is. That’s how I’m reading it. How would you read the Three of Swords (insistently) popping up to grace your psychic oil recipe? Moldavite has a kick, as you may already know. A big one. From what I can tell, it’s all about letting go and opening up. And with that kind of energy, it’s something you may want to work with in measured doses. At least, if you’re not me. As much as I lecture the world to be patient, get your two cookies later, not to be all forlorn when you find you haven’t tossed it fast enough…well, I don’t care. I want to be lessened of my psychic hangups now, damnit! I’m perfectly ready to accept discomfort for my own good, if we can just get on with it already. So I ordered this Moldavite necklace. Right around that last eclipse, when I was already twitchy with the astrological charge. The Moldavite turned it up. And I wore it, all day, every day for a couple of weeks, just taking it off for bathing and sleeping. (I don’t think I could have slept with it on.) But I was determined I was going to get the best I could from of the period, so I wore it faithfully to enhance my intention. And yes, it did it’s work. I had shadows shaking loose in every corner of my brain! Left and right. At times, quite uncomfortable, but not unduly painful considering what was being shuffled. And it moved fast! If you’re willing to endure the unsettling transition, it’s a good choice. Nonetheless, I probably could have done with a little less push. I finally decided to give it a rest–I was getting too wound up. So I grabbed my Charkra necklace again for a while. But I have it back on, in preparation for the next eclipse. I have noticed this necklace is a slightly lighter green color than my other pieces (though it looks dark in the picture), and seems to have a gentler energy than the darker green. That’s just as well, if it’s going to be hanging around my neck–and especially if I don’t have the good sense to swap it out with calmer gemstones periodically. I’m working on that “good sense” thing. Do you limit your work with any particular stones because of their energy? I was blessed with a surprise gift when Jupiter was conjunct Uranus–a minivan! It was much needed and appreciated, since I was driving a complete crap-mobile. There was only one problem–the energy. It belonged to my brother. My relationships with family are sketchy on a good day, and I’d only talked to this brother once in the decade prior. So climbing in this vehicle, thick with his energy, dredged up a lot of pain. I’d hop in to go to the store and end up bawling within minutes and it wasn’t shaking off. “That is SO you,” said my husband upon seeing these. I decided I needed to inject some “Dixie”in there and clear the energy. Started with a few accessories and added a sparkly necklace to hang from the rear view mirror. It was better, but I wanted more. Hello, seat covers! Knowing my brother would have had nothing to do with such flashy foolishness, they helped hugely. All of a sudden, I could get in without feeling sad. I also grabbed a bottle of Purification spray–love this stuff!–used it liberally, and stashed nearby for quick recharges and clearing. Much, much better. Then Jinjan suggested adding gemstones. Duh! Why did I not think of that? Specifically, Moldavite, a rare, green piece of ancient meteorite. Now, Moldavite had already hit my radar, since a recent order to the Natural Magick Shop had mistakenly netted me a whole bunch of Moldavite oil! Ten bottles of something you didn’t order captures your attention, after all. I vaguely remembered maybe having a piece of my own from eons ago. I’d gotten it when I was new at collecting gemstones, as a gift. I felt it’s vibrations like crazy when I touched it and had no idea what else to do with it. So it lived in it’s little bag, pushed behind other stuff, long put away and forgotten until I went seeking it. It showed up again, right when I asked for it. Thanks, Universe! I hung it on the rear view mirror with some ribbon inside a ring my husband gave me, adding an amethyst necklace to ground and some other personal items to round out the energetic transfusion. The results were quick and exceeded my expectations. I’ve been happily driving, sans emotional ghosts, ever since. They say Moldavite helps you transform and let go of whatever you no longer need, you know? What I didn’t expect was that within few days of hanging that Moldavite, I would be finishing up my work at Elsa’s site to be here at A Fool’s Journey, giving it all I’ve got. As hard as it was to transition (and it was), deep down, I knew it was time, to move forward and see where it led. I don’t know when I would have, though, had circumstances not come together the way they did. I credit Moldavite energy for driving the process into motion. I loved it so much, I recently ordered myself a Sterling Silver Wire Wrapped Moldavite Pendant from Amazon. I’m excited to see what other changes this stone brings. But I’ll warn you now–don’t get it if you’re not ready to be shot into the future. Do you have any Moldavite? What do you think of it?